The subject of anti-oppression is multifaceted and makes every person think of something different. Even though there are many researched and documented facts on the subject, it inevitably triggers massive amounts of emotion. Some of you may be reading this and thinking warily: “What weird stuff is this Co-op staff person going to say that could possibly touch on my experience?” Many of you may be asking, “So, what exactly is anti-oppression?” To break it down to basics, I’ll just say this: the society we live in continues to function by keeping many different populations oppressed, the dominant culture/population in control, and everything as “normal”. We see this every day in acts of racism, sexism, homophobia, classism, anti Semitism, binary gender expectations, xenophobia, ageism, etc. These oppressive thoughts, behaviors, and habits are all ways to keep the dominant culture on top and anyone or anything else down. The more we identify with populations that are oppressed, the more we see these things play out in blatant, subtle, and well-meant ways. The less we identify with these populations, the less we are able to see these things because our identity is connected with the dominant culture/population. Once we are made aware of oppression, not seeing these inequities is a choice that comes with privilege. The choice to remain ignorant and comfortable is one that anyone who identifies with the dominant culture in this society is able to make every day. The dominant culture is considered the “norm,” and everything else is considered “other”. The “norm” includes white, male, heterosexual, owning class, american, christian, hardworking, etc. The “other” is violent, scary, stupid, lazy, exotic, ethnic, fascinating, unattractive, attractive, too smart for its own good, needy, angry, unintelligible, really good at math, crazy, flaming, sinful, etc. You may be seeing the adjectives and descriptions connected to the “other” identity and recognize some of them as stereotypes. Maybe you feel that you have been identified as some of these things. Maybe you identify people you know this way. They are all attempts to define an individual or a group of people as something other than “normal”. Anti-oppression is about recognizing these realities we live with and getting down to the truth about how these realities actually affect us as individuals, as a community, and as a larger society. The work continues as we break down oppression in order to make changes that will be better for all of us. In order to do the work of “anti-oppression,” we have to be ready to get down and dirty and uncomfortable. We have to be ready to get rid of lies we have believed that have sometimes kept us comfortable. We have to be able to get past the intentions in our actions and the actions of others and face their true impact. Make no mistake, this work may not be very fun, but it can be transforming and liberating, and therefore very rewarding. No instant gratification here. In this work you will feel like you are going over the same points time after time, but when you look closely, you will see that each time you pass the same landmark, it has changed a little bit. This is, of course, the simplest explanation of oppression and anti-oppression. As you may know, or at least may be guessing by now, this issue is deep and multi-dimensional and will not be explained in a short article. WHAT DOES THIS HAVE TO DO WITH THE CO-OP? 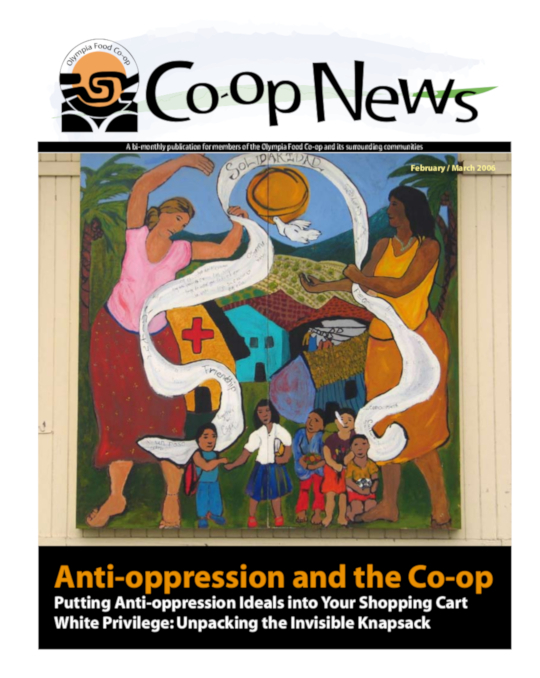 The Olympia Food Co-op has traditionally been dedicated to social justice issues. The founders and early workers (some of whom are still working here) were and are activists on many different levels. Social change work was written into the founding documents. The Co-op has always supported peace efforts, local producers, fair trade, anti globalization protests, and other social change activities. Many hours of staff labor and thought have gone into making the Co-op a more socially sustainable organization. Some examples of how this work has manifested are: the product selection and packaging guidelines, the boycott policy, support of the TULIP credit union, our low income, elder, and disability memberships and discounts, the assisted shopper program, and more. When the Co-op first became a storefront with paid workers, a very small group of people created the collective structure that the present staff still works under. That group of people decided to work collectively with a consensus decision making structure. Consensus is a method of group decision-making that takes into account everyone’s voice and where, ideally, everyone is heard equally. This structure is one of the backbones of the Co-op Staff collective. In its implicit inclusivity, consensus is a non hierarchical method of decision making. It is more work than voting or having a boss handing down their decisions to the workers, but the payoff comes in the long run, and the Co-op is richer for that investment. Back to the history lesson. So, as the Olympia Food Co-op grew over the years, the staff numbers grew as well. Originally the collective only numbered about 6 people. Before the Eastside store opened, there were 13 collective members, and that number doubled with the opening of the new store. Each year, more staff has been needed to meet the demands of the ever growing business. At this time, the collective has 56 members. One thing that became more and more clear was that there was a whole new dynamic afoot when it came to communication here at the Co-op. You see, when you have diversity, you bring into the mix all the realities of the society at large. The varying realities of oppression automatically make it so that not everyone has the same voice. Remember the part from the beginning about how our society works? So, as you may see, suddenly consensus seems a little idealistic. How can you hear everyone’s voice equally if it is not the reality of the world? It seems many people may think, in this case, you can just create a place where, despite the realities of society, we will treat everyone the same and act as if there are no differences. Is that realistic? Is it sustainable? Is it even attainable? Do you think that we have accomplished that? Do we really want to? From my experience of where we are at this time as an organization, we are just barely starting to see the reality of oppression, how it affects us, and what we can do about it. As it is, this organization is made up of individuals who are all in different places with this work, based on their identities and self awareness. In a survey that we did last year, we found that the spectrum of staff awareness goes all the way from thinking that oppression doesn’t even exist and efforts towards anti-oppression should be kept out of their workplace to some who are dealing with it on a daily and continual basis and desperately wanting their workplace to be safer for them. So, now where do we go? How do we find a common place to work on this together as an organization and to share it with the larger community? Can we? In the last few years, many conflicts based on issues of oppression have led staff toward having to figure out our stance on anti-oppression work in the organization. Many staff have been doing individual work toward their own understanding. That work looks like everything from a book group, to intense conversations, to dealing with privilege and the conflict that brings. Reflecting on the survey I spoke of earlier, everyone is still in dramatically different places with that work. As for the organization, there has been a slow movement to incorporate anti-oppression into our daily work and awareness. So, we are talking about embracing this work. Agreeing on how to do that and using the tools of consensus with a group of people as large as we are has proven to be a daunting task. We are merely at the stage of realizing that in order to do this work as a group, we need to start with ourselves as individuals, and we also need to acknowledge the effect of this work on everyday tasks in the stores. As a collective, we need to agree upon ways to support each individual in their own work and be able to recognize this work in an evaluative and empowering way that acknowledges our differences in ways that go further than we ever have. We need to be able to see each individual we work with and be aware of how societal oppressions affect one’s reality as a collective member. We need to look at ourselves with that same lens also. Beyond the ideals written into our documents, the actual expectations remain ambiguous. At this time, all new staff and Board of Directors members go through a 3 to 6 hour intensive anti oppression training. We are also spending quite a bit of time trying to figure out how to rework our collective management structure to better fit our growth in numbers and awareness of social justice. In our reorganization of the management structure, there are a number of organizational committees either existing or being created for the purpose of supporting, educating, and empowering individuals in the issues of oppression. Some of these committees are: the Anti-Oppression Committee, the Conflict Resolution Committee, and the Consensus Process Committee. These committees and others are creating space to deal with how societal reality impedes equality and consensus at the Co-op, in Olympia, and in the world as a whole. We are trying to create structures we can all agree to that will empower the voices society disempowers, as well as hold accountable those with privilege. We are just beginning to scratch the surface of understanding. As we slowly evolve, we hope to share with our community what we discover, and we also hope to support the efforts being made by groups and individuals outside of the Co-op to move toward a more aware, egalitarian, and sustainable society.